Listen up all of you drum corps fans traveling to Madison for the 2006 DCI World Championships presented by A.J.Wright! Online hotel reservations for the DCI fan block through the Greater Madison Convention and Visitors Bureau will close out on July 5. While you still may be able to find hotels after that day, availability will be extremely limited and special DCI rates will no longer be available. Drum Corps International wants to see you in Madison come August, so don't delay and make those reservations now! 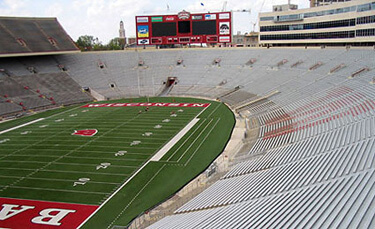 Camp Randall is ready for drum corps this August. Have you made your hotel reservation? Book your reservations before July 5! Already have a reservation, but need to make a change or cancellation? Make those changes as soon as possible since many hotels have strict cancellation policies. Contact Cara Scholke (scholke@visitmadison.com or 800.373.6376 x208) at the Greater Madison Convention and Visitors Bureau with any changes.